Geographical location. Population. The area of Pskov Oblast is 55.3 th. km2. Pskov Oblast has administrative borders with Novgorod, Leningrad, Tver and Smolensk Oblasts and external borders with Belarus, Estonia, and Latvia. The region has two relatively large economic centres: the city of Pskov in the central part, and the city of Velikiye Luki in the south. Numerous lakes (more than 3,000), rivers and rivulets provide favourable conditions for the development of environmental, restorative, fishing and water tourism. Natural resources. Pskov Oblast has bountiful timber resources. 40% of the total territory of the region occupies forests. 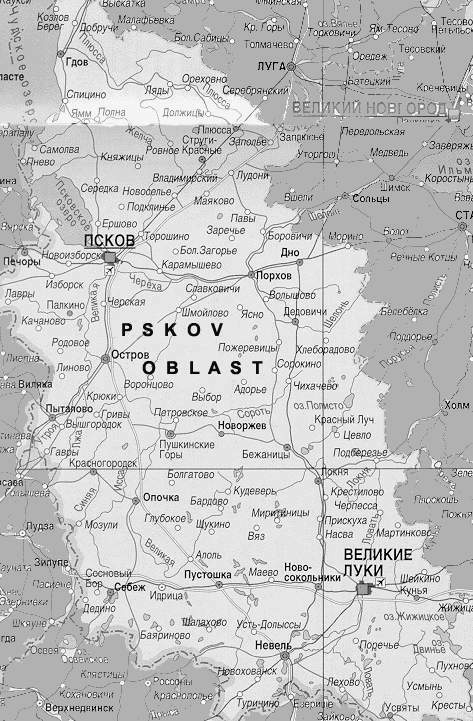 There are peat, limestones, dolomites, marls, gypsum, sands and others in the Pskov Oblast. Transport. Pskov Oblast has well developed transport infrastructure. The operational length of railway tracks is 1100 km and extent of motor roads is 9900 km. The density of motor roads (hard covered) is 180 km by 1000 sq. km of the territory. The region is situated at the crossroads of the motorways and railways connecting Moscow with Riga and Tallinn, and St. Petersburg with Riga and Kiev. Pskov has the river port at coast Pskovsko-Chudskoe Lake. About 10% of the total volume of Russian cargoes goes through Pskov Oblast. Administrative and territorial division. Administration. Administratively, the region includes 24 districts and 14 towns, including 3 towns under oblast jurisdiction (Pskov, Velikie Luki and Ostrov), 13 settlements and 247 rural administrations. The Legislative Assembly is a standing legislative and representative authority of Pskov Oblast. The governor of Pskov Oblast is the highest executive and the head of all the executive bodies. He has seven vice-governors, who coordinate activity of nine committees. Economy. In 1998 GRP for Pskov Oblast was R 6512.2 mln or USD 314.6 mln. It amounts to 0.3% of GRP of the Russian Federation and 2.7% of GRP of the North-West Russia. GRP per capita in 1998 was R 7978.7 or USD 385.4. Industry. The key industries of Pskov Oblast are mechanical engineering, metal working and electrical engineering. The electromechanical equipment for cars, welding equipment, electrical cable and automatic telephone made in Pskov Oblast amounts more than 1/3 of the total Russian production. Traditional branches of industry are food and light industries. In Pskov Oblast was developed the special program of development of linen industry. Important place in the economy of Pskov Oblast has power complex. Power complex includes five enterprises, basic of which is Pskov GRES. In Pskov Oblast, in 1997 the decline of industrial output was slowed down, and the index of industrial output was 88% of 1996 level. During next years the increase of the industrial output (102% in 1998 and 120% in 1999) has begun. Agriculture. Pskov Oblast has a half of the agricultural lands of North-West of Russia. The main agricultural branches are dairy and meat live-stock husbandry, growing of vegetables and potatoes and linen industry. Investment activity. In 1999 in Pskov Oblast total volume of investment in the fixed assets increased by 21% (to the level of 1998). Branches which are attractive for investors are industry (17.3% of total investments), transport (12.0%) and house building (14.8%). Foreign investments in Pskov Oblast in 1999 amounted to USD 2.8 mln (only 76% of 1998 level). Main bulk of foreign investments goes to trade and public catering (43.0% of total foreign investments), building (33.1%) and industry sector (15.7%). In accordance with the regional Law on Attracting Investments foreign investors have various tax benefits, including privilege under the profit tax.